There are two kinds of industrial compressor machines. There are fixed speed machines, and there are variable speed machines. Both kinds of compressors have differences in how they operate. With a fixed speed compressor, the motor runs constant, at one speed. For example, this machine will sit, and it will run all the time at a certain RPM. If somebody needs some air during the plant time, the inlet valve will open up a little bit. If they don’t need air, the inlet valve closes. It doesn’t actually ramp the motor up and down, it just uses a flutter-type effect on the inlet valve. A variable speed machine is a different story. It will actually use a variable speed, or VFD drive, which allows the motor to actually ramp up and down, allowing for energy savings. If the variable speed machine needs to, it can go down to a 20% flow, and in turn, it can also go all the way up to a 100%. 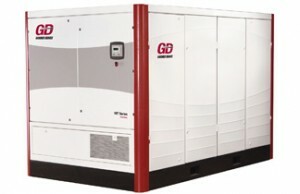 A 100-horsepower compressor could go down to the equivalent of a 20 horsepower compressor or less, saving energy in the long-run.